Quite often, drives from which the data are to be recovered have bad sectors, or those sectors that are very hard, even impossible, to read, mostly due to hardware problems. R‑Studio tries to read such sectors several times. The number of tries is specified either on the Settings/​Bad Sectors dialog box, or on the Properties tab, the Drive Control section, for each drive separately. R‑Studio fills the space in the image file where the bad sectors should be with the pattern specified in the Pattern to fill bad blocks field on the Settings/​Bad Sectors dialog box. Please note that R‑Studio writes the pattern on the image, not on the source drive. If Skip files with bad sectors on the Recovery dialog box is cleared, R‑Studio fills bad sectors in the recovered file with the pattern specified on the the Settings/​Bad Sectors dialog box . Information about such files will appear in the Log . If Skip files with bad sectors on the Recovery dialog box is selected, R‑Studio skips files with bad sectors and displays their list on the Files with bad sectors dialog box when the recovery has been completed. You may select files to immediately recover them or to mark for later recovery. You may also save this list to a text file. Click this button to select all files in the list. Click this button to unselect all selected files. Click this button to mark all selected files in the list. 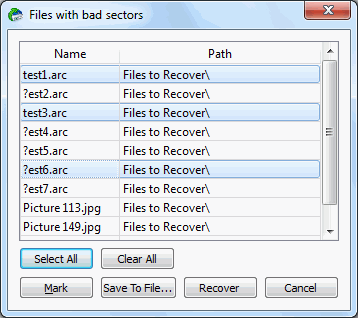 Click this button to save the list of files with bad sectors to a text file. Click this button to immediately recover selected files. The bad sectors in the recovered files will be filled with the pattern specified in the Pattern to fill bad blocks field on the Settings/​Bad Sectors dialog box. Bad sectors in the objects viewed/​edited in the Text/​hexadecimal Editor are shown as filled with the pattern specified in the Pattern to fill bad blocks field on the Settings/​Bad Sectors dialog box.